What Cardio Machine Is Best for Bad Knees? Bad knees can quickly get in the way of regular exercise, especially with chronic conditions like arthritis. However, just because your knees are bad does not mean you have to give up aerobic exercise. There are equipment options at your local fitness center and for the home that can help you gain the benefits of aerobic exercise without painful side effects on your knee. The problem with traditional aerobic exercises like running, or even walking, is the impact of your feet against the ground. Each time your feet move up and down and touch the ground to push your body forward, your joints are jolted and stressed, especially the joints of your knees, back and ankles. To reduce the impact of cardio on these joints, you need to remove the impact while still providing resistance on the muscles. 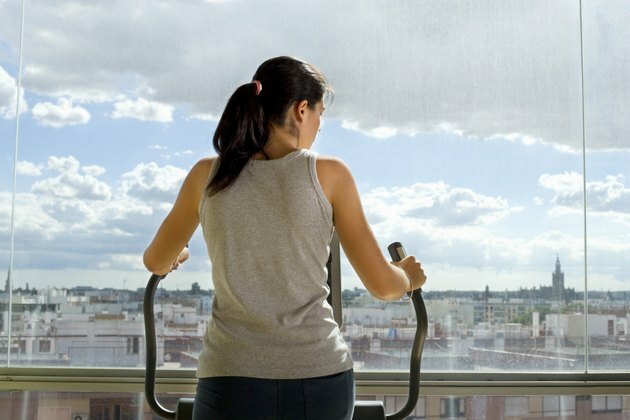 This can be done through cardio machines like the stationary bikes and elliptical trainers. Stationary bikes have two main benefits when it comes to relieving pressure on your knee joint during exercise. First, stationary bikes utilize a seat. When you sit, you take the pressure of your weight off the knee, reducing stress on the joint. Second, stationary bikes completely remove the impact of your feet against the ground by utilizing a circular motion to create exercise. Instead of up and down, your feet move in circles, using resistance on the pedals to create exercise instead of the resistance of your weight to develop the muscles and increase your heart and respiratory rate. Like stationary bicycles, elliptical trainers also are low impact on the knees due to the circular motion of the equipment. Elliptical trainers mimic the motions of cross-country skiing. Your feet move the pedals in a circular motion, while some models also employ movement of the arms as if holding ski poles. Like a stationary bike, elliptical trainers provide exercise through changing the resistance of the pedals. The higher the resistance, the more your muscles have to work to move the pedals, creating a greater aerobic workout. The aerobic benefits can also be increased through higher speed, or on some models, increasing the incline of the machine. To gain the benefits of these knee-friendly exercises, it's important to include at least 150 minutes of exercise on the machines each week, according to the Centers for Disease Control and Prevention. Combine this exercise with at least two days of strength training and a healthy, low-calorie diet for an even greater positive impact on your health. Mayo Clinic; Elliptical Machines: Better Than Treadmills? ; Edward R. Laskowski, M.D. Centers for Disease Control and Prevention: How Much Physical Activity Do You Need? Is Step Exercise Bad for the Knees?